Powers/Abilities: Johnny Sockets was deadly with a knife and used sedatives on her victims. 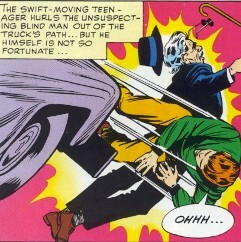 (Daredevil: Father#6 (fb) - BTS/Daredevil I#1) - Young Matt Murdock saved Maggie's blind father from getting hit by a truck. He went on to sexually abuse Maggie over the following years. (Daredevil: Father#1 (fb) - BTS) - Maggie married Sean Farrell and he worked hard to support them and get them out of New York. He took a job with the sanitation department in New Jersey and moved near there, but was devastated when Maggie came down with cancer and soon discovered she wouldn't be able to have kids. They determined that New Jersey Power and Light were behind it. After they unsuccessfully petitioned the company, even organizing protests, they got nowhere. She wanted to sue the company and seek out Matt Murdock's legal help. (Daredevil: Father#6 (fb) - BTS) - Maggie heard the news reports that Matt Murdock was suspected to be Daredevil. She suddenly blamed him for all her life's unhappiness. She had a psychotic break and wanted to make Matt as unhappy as he'd made her. (Daredevil: Father#5 (fb) - BTS) - Without telling Maggie, Sean started taking night classes in the city. She thought he was having an affair. He, in turn, thought she was cheating on him with Murdock as he found a scrapbook of Murdock and Daredevil that she'd been keeping. 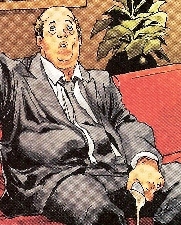 (Daredevil: Father#6 (fb) - BTS) - Franklin “Foggy” Nelson showed Maggie into Matt's office, where she could wait for him. She grabbed his black book, full of his former clients, so that she could target them in her upcoming murders. (Daredevil: Father#1) - Maggie met with Matt in his office and asked him to help in her lawsuit against New Jersey Power and Light. Sean came in and impatiently sat through the meeting. Matt promised to look into things as Foggy showed them out. Later, Maggie went home with an overweight woman and killed her after cutting out her eyes. (Daredevil: Father#2 (fb) - BTS) - Maggie continued killing others and the media dubbed her the Johnny Sockets serial killer. (Daredevil: Father#2) - Maggie targeted Kristy McKaden at Club 69 and killed her in the alley. Security guard Sammy Rico saw Maggie running away form the body. Maggie showed up to her next meeting with Matt and Foggy with sunglasses to cover a black eye she'd received, and they assumed it was from Sean. They introduced her to private investigator Jessica Jones. Maggie walked out when they suggested Sean was abusing her. At home in Hoboken, Sean and Maggie argued over the state of their marriage. He rushed out and Maggie cried, assuming Sean was having an affair. (Daredevil: Father#3) - When Sean suggested Maggie needed medical help, she screamed at him just as Matt called. She quickly hung up on him, agreeing to meet with him tomorrow. (Daredevil: Father#4) - Maggie met with Matt in the park and she noted that he was covered in bruises. She was interrupted by a call from her dad, promising to visit him soon and growing upset when he called her bad names. When Matt questioned her about her bruises again, she slapped him, fired him as a lawyer, and walked away. Maggie listened to news reports on the Johnny Sockets killings as she sharpened her knives and planned to kill Stanley Pheiffer. She convinced him to meet with her privately, despite his reservations about it being wrong. After she spiked his drink with a sedative, Maggie cut out his eyes and killed him. She left Murdock's book at the scene of the crime this time. (Daredevil: Father#5) - Matt called Maggie again and quickly shared his suspicions that Sean may be putting her in danger. Sean grabbed the phone and ordered Matt not to call them again. While they fought, Maggie stabbed him in the stomach, then rushed off to kill Foggy, planning ultimate revenge on Matt. She sedated Foggy's drink, flirting with him, then tied him up. 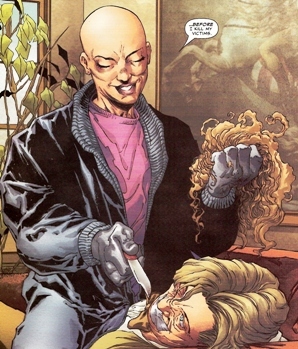 AS she sliced his cheek in preparation of cutting his eye out, she pulled off her wig, revealing her bald head. (Daredevil: Father#6) - Matt entered to stop Maggie, and she screamed at him about how stupid he'd been for not figuring out who she was before this. FBI agents rushed in and ordered that she drop the knife. She finally did so, but they opened fire anyway, killing her and destroying her plans to write a tell-all book about Matt. In her dying breath, she told Murdock what her father had done to her. Comments: Created by Joe Quesada and Danny Miki. Over the years Maggie's father reappeared in many Daredevil stories as part of Daredevil's origin. Johnny Punk, Hostess Ad, Daredevil foe @ Daredevil vs. Johnny Punk! (Daredevil: Father#2) - Maggie Farrell, the Johnny Sockets killer, targeted Kristy McKaden, a former client of Matt Murdock's, at Club 69 and killed her in the alley. (Daredevil: Father#4) - Maggie Farrell, the Johnny Sockets killer, convinced Stanley Pheiffer, a former client of Matt Murdock's, to meet with her privately, despite his reservations about it being wrong. After she spiked his drink with a sedative, Maggie cut out his eyes and killed him. (Daredevil: Father#2) - Security guard at Club 69 saw the Johnny Sockets killer running away from the body of Kristy McKaden. He later interviewed with Coco Dior about it. (Daredevil: Father#1 (fb) - BTS) - Maggie married Sean Farrell and moved away. (Daredevil: Father#4 - BTS) - Maggie got a call from her dad, promising to visit him soon and growing upset when he called her bad names. 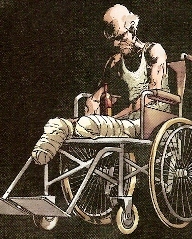 (Daredevil: Father#6) - Maggie's dad was drinking in his wheelchair, both his legs off, w hen he heard someone come in. As he drank, complaining of diabetes costing him his legs and his sight, the stranger told him Maggie was dead. He told the man he was responsible for damaging Maggie so deeply, then confessed he was Matt Murdock. The man sank in tears, begging for forgiveness.